Self-anointing is probably the strangest and most unexplainable of all hedgehog behaviors. It is completely normal and causes no harm to your hedgehog. Some references refer to self-anointing as “anting”. Anting in birds, as with hedgehogs, is a form of self-care. Hedgehogs will lick or chew the object of interest and create foamy saliva or lather which they will then deposit onto various parts of its body. It is not uncommon for new hedgehog owners to think their hedgehog is having a seizure or is vomiting. Vomit tends to be more slimy than frothy and usually is a result from motion sickness. Substances that can provoke self-anointing include chemicals, perspiration, leather, perfume, hand lotion, soaps, traces of food on your hands (especially garlic), and excrement. Hedgehogs that anoint frequently or that anoint with a particularly colorful or smelly substance may need a bath. The color of the anointing froth is dependent on the source of the anointing substance. For instance: blueberries produce blue froth and a new food will produce the same color froth as the food. 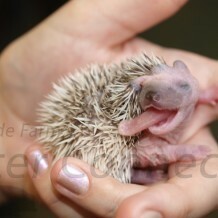 Hedgehogs can self-anoint at a very early age, even before their eyes are fully opened. The first sign that a hedgehog is going to self-anoint is that they will show a fascination with a particular odor or taste. Your hedgehog is likely to chomp its teeth or chew at the substance to create the anointing froth. You may see your hedgehog twist and contort in a variety of funny positions as it spreads this foamy saliva on its body using its surprisingly long tongue. Many hedgehogs become so engrossed with this activity that they become oblivious to anything going on around them! The reasons hedgehogs self-anoint are still unknown, but it is usually related to a new or pleasant smell. Some people believe anointing is a form of scent camouflage designed to cover up their own scent in the environment for protection. Others believe the hedgehogs like the scent so much that they want it on their body similar to our “perfume”. Hedgehogs are resistant to many toxins and one theory is that hedgehogs spread toxins on their spines as added protection or as a repellant to its enemies. Another possible explanation is that they are trying to remember a particular smell by mixing it with the saliva and then depositing it on the spines. Male hedgehogs tend to anoint more than females, but the reason for this trend is unknown. Light-colored hedgehogs tend to look messier with anointing and anoint more frequently than darker hedgehogs. Many believe the lighter colored hedgehogs are trying to camouflage with their environment more so than the darker hedgehogs. Hedgehogs may lick and self-anoint with things that could be poisonous to them. Be cautious of houseplants, cleaning chemicals, feces of other animals, etc. 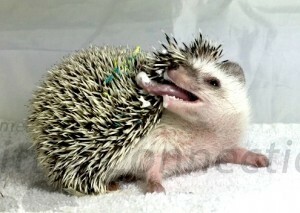 The foam spittle on the hedgehog quills is not dangerous. Some anointing spots are simply saliva. It dries clear and doesn’t require removal for the hedgehog to appear normal. It is your discretion if you don’t mind small amounts on the quills and you leave it, or if you prefer to wipe or wash it off. Some anointing material will simply wipe off with a damp paper towel. Never use any type of cleaning was or soap that is not ingestible because your hedgehog may self-anoint with that new smell. Some particularly messy deposits on the quills may require a bath to thoroughly clean off the anointing material. The color of the hedgehog and the substance used to anoint plays a part in dried spittle visibility. Some substances may stain light colored hedgehogs but staining is not typical.